Planning by advocates of a sprawling water district to manage the Paso Robles basin has been cloaked in secrecy and back-room deals to help insure its eventual formation. Legislation carried by Assemblyman Katcho Achadjian (R-San Luis Obispo) was significantly amended following a flurry of last-minute discussions between the lawmaker and district backers in early August, dozens of emails obtained by CalCoastNews show. The assemblyman then got the nod for his changes from four county supervisors — Frank Mecham, Bruce Gibson, Caren Ray, and Adam Hill — with Debbie Arnold choosing to remain neutral. Key amendments inserted as a mid-summer legislative deadline approached altered the formula by which a water district could be formed — from a majority of landowners to 10 percent of the 4,500 landowners within the proposed district boundaries. This amendment was included because a cadre of influential supporters expressed their belief that a simple majority of district property owners voting to approve a district was an unachievable goal. In other words, even if the required number of landowners within the proposed district’s boundaries declined to endorse a district, a simple majority on the Board of Supervisors could petition LAFCo for its formation. Numerous emails during the two-week period prior to the passage of AB2453 from Achadjian were distributed to only two supervisors, then-chairman Gibson, and Mecham whose First District overlies the most impacted part of the water basin. Mecham and Gibson are two of the seven LAFCo members. At one point in April, Achadjian sought “an environmental group from the area that supports it” [the water district]. “Do you have a recommendation for a group that would be interested in supporting this legislation to ensure the groundwater pumping in the basin is regulated?” he wrote to Gibson. On one occasion, Achadjian notified Gibson that Arnold was in Sacramento circulating materials opposing the district’s formation. During this time, Achadjian appeared to be seeking an indication of unanimity from a variety of entities within the proposed district boundaries. His bill, Achadjian wrote to Gibson in early April, “represents a year-long negotiation between two very different factions of landowners within the Paso Robles Groundwater Basin.” Achadjian referred to PRAAGS and PRO Water Equity, two groups which joined efforts to form the district. PRO Water Equity has four members; PRAAGS has repeatedly declined to respond to inquires about its membership. Those two bodies have dominated the effort to form a water district, and their suggestions were heavily incorporated into the last-minute changes in AB2453 — changes that appear to have smoothed the eventual path to a district. Both groups threatened to withdraw support for the bill if their wishes were ignored. “I wouldn’t sponsor this bill is it didn’t have the support of the county, the city of Paso Robles, and many other interested parties,” Achadjan said during a recent segment of Dave Congalton’s Home Town radio show on KVEC/920 AM. “Those groups (PRAAGS and PRO Water Equity) are made up of the same people who are responsible for the heaviest pumping” from the basin, said Greg Grewal, a Creston rancher who often advises Supervisor Arnold on water matters. “Katcho’s bill does nothing to conserve or provide water, it just targets a specific group of landowners” to be included in the district’s proposed boundaries. Emails between Jerry Reaugh, president of PRAAGS, other officers in the group, Achadjian, and Gibson during the bill’s August metamorphosis showed that PRAAGS hoped to involve itself even more. PRAAGS is comprised primarily of vintners, ranchers, and vineyard support organizations. Reaugh and board member Bob Brown attempted to include PRAGGS’ attorney Ernest Conant in drafting the bill’s wording before it was submitted to the Legislative Counsel for an opinion on its legality. Conant helped form PRAAGS in late 2013. He currently is general counsel for the Kern Water Bank Authority and helped develop the Semitropic and Arvin-Edison Water Storage District’s water banking programs. The city of Paso Robles is the biggest user of basin water by far and it will not be included in the district, but its water officials are playing a critical role in its formation. 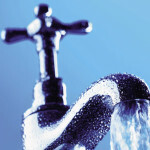 “The city and the biggest growers don’t want to slow their pumping, but they want everyone else to do so,” said Grewal. Letter to the editor: Is it time to dissolve Los Osos? “The State Water Resources Control Board may intervene if a GSA is not formed or it fails to adopt or implement compliant plans by certain dates. Good analysis. As I read it, this new law says we must have a GSA by June 2017. That doesn’t give us much time. Who want’s the State? There is no way the water court will rule on the lawsuit by then. We will have to figure this out on our own. Gibson is everywhere but his own district. Why? I don’t see Arnold messing with the sewer or the depleted aquifer in Bruce’s district. I don’t see Meacham dealing cards outside his region. Even Hill generally keeps to his own district, unless instructed to do Gibson’s bidding. Ironic that the town of Harmony is in his district. Maybe we can temporarily rename it Disharmony while Bruce remains in office. And for being such a devious scoundrel, our own Katcho gets named “legislator of the year.” Yeah, that’s how it goes these days. Also love Gibson’s speaking out of school about the Sierra Club. Why does such an arrogant one keep getting re-elected? Because his opponents are even worse, I guess. The slo county flood control district is already the lead agency for all the individual unincorporated water districts of the county and supposedly already manages each of those. And the BOS already has that plaque on the wall that says “the buck stops here”. They are the 5 most powerful people in the county who have the final say in what these agencies do and how they get their funding. IMHO, it is purposely made confusing and hard to follow. And why would the county tax payers be expected to fork over even more tax money to pay for a “new” agency and fund it’s now needed employees, if there is already one now. Are these new positions for this new agency going to infilled by existing employees or new hires? It was my impression the county is already having a hard time keeping all the departments funded and positions filled. County staff always makes it’s staff report to the BOS on every topic and always make their recommendations to the board based on those staff reports, whether or not the public is actually allowed to see or comment on them at the BOS meetings. So I’m still confused a bit. It is OK to keep/make the Flood Control District function as the lead agency, when Supes that don’t live on top of the Paso Basin will help in making the decisions for that basin? Gibson, Hill and sometimes even Compton vote the same way – who do not live on top of the basin. Mecham, who does live on top of the basin, votes with Gibson and Hill sometimes too. It is nice to see such trust in the Supes as that isn’t always evident from the commenters at the meetings. Voting with Hill and Gibson should not be a goal of Mecham and Compton! Hill and Gibson in general, bring in outside ideas and jam them down our throats. If Gibson can remove your property rights and tax/fee you to death and Hill accuses the public of being racist NO ONE should vote with them. These two should be marginalized and REMOVED! They are rude, hateful and control freaks. So no, FairAndBalanced I disagree with your attempt to honor Gibson and Hill. I did not elect a supervisor to kiss it up and go along to get along with Gibson and Hill. I want a supervisor to question the status quo to defend ME against the growth of government and reaching into my pocket again and again. WOW, people sure read stuff into things! I am trying only to get at the reasoning behind wanting the Flood Control District to control the Paso Basin. I see your opinion phoenix.rising many places, against Gibson and Hill, but as they seem to get elected often and do get other Supervisors to vote with them (not Arnold), how do you think having them control the basin is a good idea? The control of the Paso Basin is my topic if someone would like to address that? It might be time to follow the money. Who have been the biggest donors to Mecham and Arnold in respect to these water issues. I think Mecham has stated that he will not be running for office again although Arnold will be. The campaign money should start rolling in soon as the campaigning will soon begin if it hasn’t already. As usual the little guy will more than likely be the big loser when this is over and the big guns with the money will prevail. Katcho and Frank have been bought off by the big money that is looking to take control of our water. I hope the first district can put up a candidate to send Frank packing. I used to support Frank but I truly feel he is out for himself. Frank, you have sold your constituents out. I think I am missing something here. The basin was proposed to be managed (I think by Arnold) by the Flood Control District at one point. Isn’t that under the control of the Board of Supervisors? If that is the case, non-Paso Basin people would be making decisions for that Basin. What other management ideas were there, other than this proposed LAFCO-created District or the Flood Control District? Yes you are missing something here. First, Supervisor Arnold is most definately not an instigator for creating another layer of governance. I consider this whole basin discussion to be like minded with what is mine is mine and what is your’s is negotiable. Sure the coined answer is that this is all very complicated. Complicated it must be inorder to cloak the taking. The simple answer would be to first hold our ground and test the sovereignty that our Incorporated County of San Luis Obispo is afforded under the Sate of California Constitution. This would be my first challenge before funding county staff to run in every dirrection, again, at your expense.